Nearly three-quarters of a century after the Shoah ended, we are still learning about aspects of what happened. For example, the documentary The Good Nazi tells the little-known story of a Nazi from Vilna who tried to rescue more than 1,200 Jews. It airs on VisionTV Jan. 21, and again April 29. In 2005, Dr. Michael Good sought out Prof. Richard Freund of the University of Hartford to tell him about Maj. Karl Plagge, a Nazi who oversaw a military vehicle repair complex that was used as cover for 1,257 Jews in Vilnius (Vilna). Good described how his father, mother and grandfather were saved within this complex, and later wrote about it at length in his 2006 book The Search for Major Plagge: The Nazi Who Saved Jews (Fordham University Press). While interesting to Freund, who works within a department known for its Holocaust studies, nothing further came of that meeting. That is, until 2015. By then, Freund had directed six archeological projects in Israel and three in Europe on behalf of the university, including research at the extermination camp at Sobibor, Poland. In 2015, he was in Lithuania doing research on a Holocaust-era escape tunnel, adjacent to the Great Synagogue of Vilna. He and his team had brought with them specialized equipment that enabled non-invasive examination of the ground and walls, and they offered it to anyone wanting to do such research. 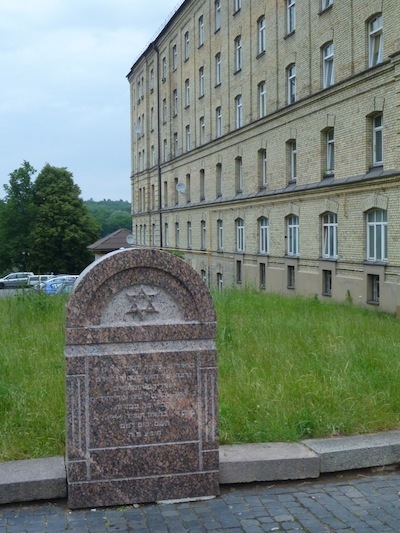 The Vilna Gaon State Jewish Museum came calling, and brought Freund to a site on the outskirts of Vilna, where he was told about Plagge. Freund connected with survivor Sidney Handler, who was 10 years old when he hid from the Nazis in the work camp. After the Nazis left in July 1944, Handler was forced to move dead bodies, and could point out decades later where 400 Jews were buried. “We could have gone through the entire 20 acres and not located exactly where that was,” said Freund. Using scanners, thermal cameras, radar and other methods, Freund’s team discovered and recorded the various hiding places, also called malinas. Under Plagge’s plan, Jews had built malinas in building crevices, behind the walls, to keep out of sight when Nazis came to “liquidate” the complex. The garage (repair shop) was dubbed HKP. It was on Subocz Street and is likely the only Holocaust-related labour camp left completely intact. Until recently, people had been living in the two six-floor buildings, which comprised 216 apartments. Freund reached out to filmmaker Simcha Jacobovici, telling him how important it was to document the site, the story, and reveal it to the world. Things were made all the more pressing when Freund and Jacobovici discovered that developers were going to demolish the site. Fortunately, before this happened, Jacobovici took a film and photographic crew to HKP, in January 2018. 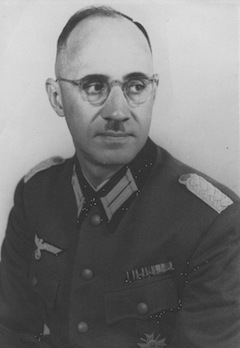 In 1941, Karl Plagge was placed in command of the HKP 562, a unit responsible for repairs of military vehicles damaged on the eastern front. Plagge experienced something of a pang of conscience – he hadn’t signed on to genocide. He made the decision to leverage his position and use Jews as “slave labour” for HKP, pleading the case to his superiors that, if Jews didn’t work there, there would be no one to fix the vehicles. Virtually none of the 1,200 Jews was knowledgeable in fixing cars; they were accountants, lawyers, hairdressers, academics, cooks and others. They all learned various HKP tasks on the job, and Plagge somehow convinced the Nazi SS that every single one of them was necessary for HKP. Even though the entire charade was met with a barely tolerated wink and nod by Nazi brass, Plagge had a deep (and correct) hunch that their patience would eventually wear thin. Heinrich Himmler, the head of the SS, announced, in the summer of 1943, that he wanted every Jew in Eastern Europe eliminated, irrespective of whether they were contributing to the war effort in a work camp. So, with Plagge’s approval, his workers carved out malinas in the walls of the buildings and in attic rafters. As the Soviet Red Army approached the outer edge of Vilnius in June 1944, it was a sign that the Allies were nearing victory. In this context, on July 1, 1944, Plagge made an impromptu announcement in front of an SS commander and the Jewish workers, who gathered to listen. He explained that his unit was being transferred westbound and, though he requested his labourers be allowed to join, his superiors wouldn’t permit it. All of this was code for the Jewish prisoners to take cover. Roughly half of the workers – some 500 of them – hid away in malinas or ran from the camp, while others decided to stay. When Nazi troops took over the camp two days later, 500 Jewish workers appeared for roll call, and were killed. It took the Nazis three more days to comb the camp and the surrounding area for any survivors, eventually finding roughly 200 Jews, all of whom were shot. When the Soviets finally took over Vilnius later that week, approximately 250 of HKP’s Jews in hiding emerged. When the war was over, Plagge returned home to Darmstadt, Germany, where, for the next two years he lived quietly, until he was brought to court as a former Nazi. Somehow, word traveled to a displaced persons camp in Stuttgart, a three-hour drive away, where many survivors of HKP had ended up. In Plagge’s defence, the survivors sent a representative to testify to the court in the hopes the charges would be overturned. The testimony resulted in a favourable judgment, and Plagge received the status of an exonerated person. In 2005, after evidence and survivor testimony, Yad Vashem: The World Holocaust Remembrance Centre posthumously bestowed the title Righteous Among the Nations on Plagge. The Good Nazi was produced in Canada for VisionTV by Toronto-based Associated Producers. Jacobovici was writer and executive producer, Moses Znaimer executive producer, Bienstock producer and co-director, Yaron Niski co-director and Felix Golubev line producer/executive producer. “I see a sign that we will meet each other face-to-face in our land, our homeland, Eretz Israel,” wrote 10-year-old Eliezer Rudnik in 1937 to his aunts who had immigrated to Palestine. 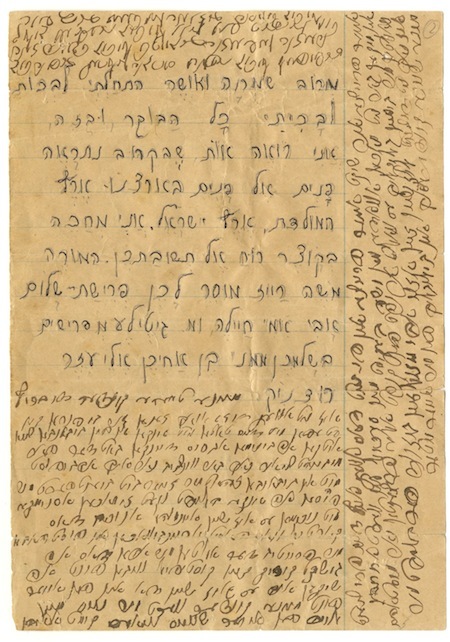 The letter, written in Hebrew, is surrounded by his parents’ writing, in Yiddish, as there was a lack of paper. Aryeh and Sarah Rudnik and their son, Eliezer, were the only Jews living in the Ukrainian village of Kosmaczow – they were shot and killed by Nazis in 1942. Eliezer’s letter is just one of the hundreds of items now on display at Yad Vashem, the World Holocaust Remembrance Centre, in a new exhibition, They Say There is a Land: Longing for Eretz Israel during the Holocaust. The exhibit, which opened May 30 in the Auditorium Exhibitions Hall of Yad Vashem’s Museums Complex, features artworks, artifacts, diaries, letters and testimonies collected by Yad Vashem over the years, all of which illustrate how Jews yearned for Eretz Israel during and immediately following the Shoah, from 1933-1948. It is divided into three sections. The first section presents how Jews viewed their connection to and longing for the Land of Israel during the rise of the Nazi party to power in Germany, until the outbreak of the Second World War. It was during this period that Jews searched for asylum in various countries, including Eretz Israel. The second section focuses on the years 1940-1944, from the period of the ghettos to extermination. During this stage, Jewish communities in Europe dwindled and, under their daily struggle for survival, many Jews found themselves distanced from Eretz Israel to the point of disengagement; however, their hearts’ yearning for the land remained. The third and final section focuses on the period immediately after the Holocaust – the displaced persons camps in Europe and the detention camps in Cyprus, and the establishment of the state of Israel. At this time, many survivors felt that only in Israel would they be able to regain their stature and build a full Jewish communal and personal life. The exhibition’s title is that of a well-known poem written by Hebrew poet Shaul Tchernichovsky in 1923 in Berlin. The poem brings up existential questions that characterized the Jewish people’s struggle in the interwar period, as well as the forces of dream versus reality, and hope versus despair. The Face of the Ghetto: Pictures Taken by Jewish Photographers in the Litzmannstadt Ghetto, 1940-1944, opened last week at the Vancouver Holocaust Education Centre. Produced by the Topography of Terror Foundation in Berlin, among the traveling exhibit’s photographs was a surprise – a photo with a local connection. “Unidentified in the photo caption but recognized by our education director [Adara Goldberg] during her research about this exhibit, Bronia Sonnenschein is depicted in the photo to my left,” said VHEC executive director Nina Krieger in her remarks at the opening on May 14, directing attendees’ attention to an image “showing a double wedding ceremony presided over by Chaim Rumkowski, the head of the Council of Elders in the Lodz Ghetto. Bronia was the sole survivor of those shown in this photograph. A multilingual secretary in Rumkowski’s office and a survivor of Auschwitz, Bronia passed away in 2011 but is fondly remembered by so many of us. Krieger provided context for the exhibit. “Following the German invasion of Poland in 1939, the Nazis imposed a ghetto in the city of Lodz, which they renamed Litzmannstadt. From 1940 to 1944, more than 180,000 Jews and 5,000 Roma and Sinti lived in the ghetto’s cramped quarters, with many working in factories that supported the war effort. The Face of the Ghetto exhibit is here as a result of VHEC’s partnership with the German Consulate General in Vancouver and the sponsorship of the German government. Consul General Herman Sitz was at the opening and said a few words, as did Sonnenschein’s son, Dan. Drawn from a collection of 12,000 images held by the Lodz State Archives, one of the intimate moments captured is the one in which his mother appears. “Last Friday was the historic 70th anniversary of Victory in Europe Day,” said Sonnenschein, addressing those assembled. “May 8th was personally very meaningful for my mother, as it was the date in 1945 on which she was liberated from the Nazi horror. For her, the bitterly harsh years had begun on March 13, 1938, when Germany annexed a largely welcoming Austria, immediately setting off intense persecution of the Jewish population. “My mother, with her sister and parents, were among the longest-held prisoners in the Lodz Ghetto, from its formation in spring 1940 until its so-called liquidation in August 1944. Unlike many deported there from other places, they had fled Vienna after the notorious Kristallnacht, and were living under great stress in Lodz when the family was forced from their new home into the ghetto. They were later joined by a beloved aunt of my mother who was deported from Vienna. Her cherished elderly grandmother was deported elsewhere and murdered soon after. “My mother, with her German-language and office skills, worked as a secretary in the ghetto’s Jewish administration,” he explained. “The photo in this exhibit shows her being married to Erich Strauss, who had been deported from Prague with his mother. The other bride in this double ceremony was Mary Schifflinger, my mother’s fellow office worker and good friend, whose groom’s name was Ignatz Yelin. Shown in the photo blessing the couples is Chaim Rumkowski, appointed head of the Jewish council by the ghetto’s masters in the German administration. “These five people were all transported, in the usual dreadful way, to Auschwitz, where Rumkowski was killed. Soon after, the others were sent to a less well known but no less brutal concentration camp called Stutthof. There, Mary and her husband were killed, Erich Strauss and his mother were killed, my mother’s father and aunt were killed. As my mother once said, it was a killing field. “Other photos of my mother in the ghetto may be seen on the internet, along with such photos of my Aunt Paula, who also married in the ghetto, to Stan Lenga,” continued Sonnenschein. “Unlike my mother’s first husband, my Uncle Stan survived and the couple was reunited after the war, being a part of my close family in Vancouver along with my maternal grandmother, Emily Schwebel. The local Jewish Family Service Agency gives an annual Paula Lenga Award in my aunt’s memory for exemplary volunteer service. Krieger also thanked the VHEC staff – present were Goldberg, designer Illene Yu, archivist Elizabeth Shaffer, collections assistant Katie Powell and administrator Lauren Vukobrat – and the installation crew, Wayne Gilmartin and Adam Stenhouse, as well as the consul general. The Face of the Ghetto is on display at the VHEC until Oct. 16. – With thanks to Nina Krieger and Dan Sonnenschein for providing electronic copies of their remarks.